Successfully Added Bluetooth Car FM Transmitter G7S - Noise Reduction, Call Echo Cancellation, LED Display, EDR, A2DP (Black) to your Shopping Cart. Never take your eyes off the road again with one button hang up, reject and redial. 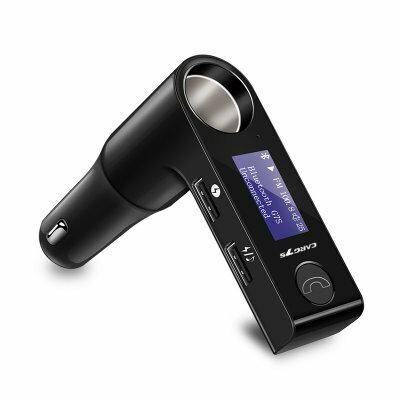 This Bluetooth Car FM Transmitter and MP3 player makes it easy to wirelessly connect your phone to your cars FM stereo, you can also answer calls from a single button. Being unable to take an important call while driving is frustrating - But picking up the phone is not only dangerous its illegal. Well, thanks to the G7S Bluetooth FM transmitter you can now safely take calls without taking your eyes off the road or breaking the law. That's because this clever little car gadget has a simple one-button answer and hang-up feature. The G7S car FM transmitter also lets you play music from your phone through your car stereo. It does this by sensing to your phone with Bluetooth 3.0. This provides a stable transmission from your phone to the device. Then just tune the FM transmitter and your car stereo to the same unused FM frequency and you'll be able to enjoy all your phones music on your cars sound system. This wonderful car gadget is powered by your cars lighter socket and thanks to the Bluetooth technology and FM transmission you can connect your phone without the need for cables. Empowered with bA2DP Bluetooth support means you get great quality while streaming audio content between the transmitter and your phone. Its the perfect and easy way to stream your smartphones music library and answer calls safely while on the roads. Thanks to the two USB ports you can charge extra devices at 5V 2.1 Amp or add an extensive music library as the devices support 32GB external memory pens. This will bring thousands of hours of entertainment to your fingertips. The G7S Bluetooth Car FM Transmitter comes with a 12 months warranty, brought to you by the leader in electronic devices as well as wholesale car gadgets and accessories..